Meet the one and only Daizy Star! She’s ready to dazzle everyone with her brand new pink guitar! At last, it’s time for her to find her very own star quality. But then Dad comes up with yet another crazy way to make his “dreams come true” – which is a shame, since his dreams are a bit like everyone else’s nightmares. He wants to drag the whole family off to Africa to help with a charity project! That’s right – swapping happy family life in Brightford for digging wells and milking African goats. Eeek! Now Daizy needs a clever plan. She’s got to win the Battle of the Bands, or she can kiss goodbye to all her friends, sleepovers and (worst of all!) custard doughnuts. She can’t let that happen, can she? 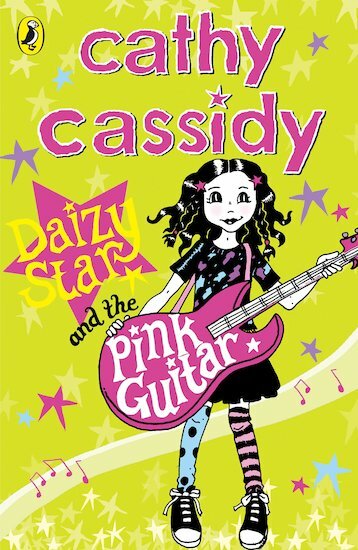 Second in the touching and hilarious Daizy Star series for younger readers from much-loved author Cathy Cassidy. Download pretty Daizy Star wallpaper for your computer! This is about daisy trying to find her star quality. This book was alright however made for younger readers unlike her other books. It was interesting but at some points of the story it became a tiny bit boring. It was not in my opinion a book you can put down or get tired by. Great book for younger readers of Cathy Cassidy.